Newport resident Hugh Willoughby was was an avid inventor, traveler, aviator, and sportsman. He built his first serious aircraft model in 1894, the same year he organized the Naval Reserve in Rhode Island (he graduated from the Naval War College in 1896). By 1900 he was a noted aerial photographer, taking pictures of cities such as Paris from balloons. By 1908 he held 14 patents for air ships and aviation devices. In 1908 he was part of Orville Wright’s support team during their very first public flights at Fort Myer, Virginia. By 1909 Willoughby had a “biplane under construction” at Newport. To illustrate how respected he was among early aviators, Willoughby was director of flying at the prestigious Belmont Park, NY air meet (October, 1910). The biplane Glenn Curtiss flew at this event was equipped with Willoughby’s patented double rudders; they soon became standard equipment on biplanes of the day. 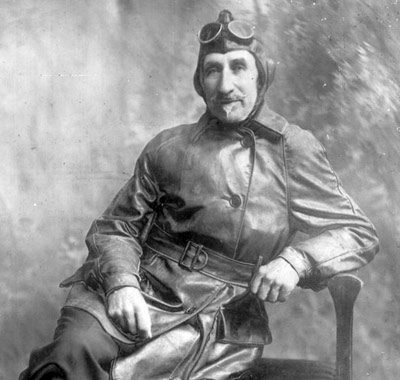 The names of other pilots who used Willoughby’s equipment (and counted him as a colleague and friend) read like a Who’s Who of aviation pioneers: the Wright Brothers, Henri Farman, Louis Paulhan, Charles Hamilton, Ruth Law, Thomas Scott Baldwin, and Roger Jannus. In 1911 he became the first person to fly a seaplane in Rhode Island—one that he designed and built himself. He later launched the Willoughby Aeroplane Company, with facilities in Newport and Sewall’s Point, Florida to build and sell aircraft of his own design. He built and flew the “Swan Triplane” as he approached his 70th birthday. He was a senior official at national air meets until close to his 80th birthday.From the time he began flying at the age of 53 until the time of his death he was America’s oldest licensed pilot.